Nothing beats the fruity flavor and delicious taste of chilled sangria served in trendy plastic cups or beautiful glassware. Sangria is the traditional refreshment of Spain. Its name is derived from a French word which means â€œbleedingâ€ in English. The name was inspired by the rich blood red color of the beverage. 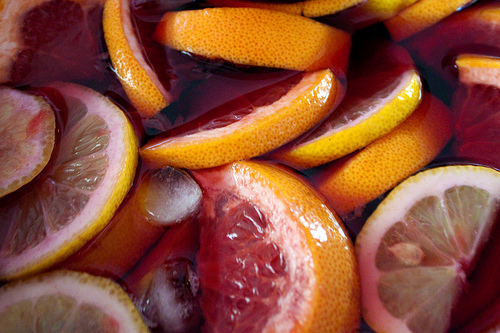 Sangria is prepared using fruits, juices and red or white wine. Hence, itâ€™s fast, easy, rich, strong and delicious. The best part is once you get addicted to its taste, you wonâ€™t mind sharing it. Why Sangria Punches Rule Summer and Parties? Sangria is a perfect drink for any season or casual beach parties that are organized during toasty summers. Its light texture, fruity taste, colorful presentation and pleasant aroma successfully charm your guests. Sangria punch is served with fruit slices and berries on top. This enhances the taste of red wine. Hereâ€™s a quick and simple recipe for it. 1. Choose a cheap quality red wine like Shiraz, Rioja, Cabernet Sauvignon or Rioja. If youâ€™re a connoisseur who prefers taste over money and expenditures donâ€™t bother you, feel free to choose an expensive version. 2. Measure 1 cup of wine and pour it in a mixing bowl. Add orange liquor or fresh orange juice, lemon juice or lime syrup, fresh pineapple juice or any pineapple flavored rum and few teaspoons of sugar. Sounds cool isnâ€™t it? Add a generous amount of white wine (you may choose Chardonnay) for enhancing its flavor. 3. Choose your favorite seasonal fruits. Add 1.5 cups of diced fruits to the wine mixture. You may use orange pieces, pineapple slices or lemon chunks. Mix them well. 4. Refrigerate the punch for at least 5 to 7 hours on a cool, dry temperature. If you want the tastes to really mingle, just leave it overnight. This way, the flavors will come out nicely and you can serve cold punch to your visitors. 5. Your fruit nâ€™wine punch is ready. Measure exactly 1-2 cups of the punch and pour it in the pitcher. Add lemon-lime soda and club soda if you want to make it bubbly. Toss in pineapple and orange ice cubes to prepare an instant fruit splash. 6. You may sprinkle sliced strawberries, ginger ale, blueberries, raspberries, cubed apples, sliced pears and diced peaches on top and youâ€™re done! Donâ€™t add bananas or other soft fruits because they easily dissolve in acidic wines. # Add crushed ice cubes to wine glasses or balloon glassware. Pour sangria into the glass and top it up with lemon slices or apple wedges for aesthetic presentation. Add a straw and miniature umbrella too. Sangria punches are fun to make. Theyâ€™re delicious and refresh you in a second. The best part is theyâ€™re fairly inexpensive as compared to other cocktails and alcoholic beverages. As an added bonus, you may use cheaper wines to save your money. # Drink your punches responsibly. Sangria contains hard liquor that may affect your palate. Donâ€™t puke all over the carpet. Your host wouldnâ€™t appreciate that. # Donâ€™t serve fruit punches to minors less than the legal drinking age. Anthony Roberts is a chef and an avid blogger on food and wine. He also gives tips and ideas on how to make dishes tastes even better with the right kind of wine. He has featured wines such as chardonnay, and pinot gris. Presently, he writes wine notes on Taylors wines.